The new Nazi Party, the party of treason, is also the party of deep and unrestrained corruption. While the Democrats spin endless fantasies about supposed collusion between Trump and Russia, the corruption is pandemic on their side of the aisle. The fortune that Nancy Pelosi has amassed clearly hasn’t come from her Congressional salary. So where has it come from? There needs to be a full, searching, serious investigation of Pelosi’s finances, but there won’t be, because her fellow Democrats are as corrupt as she is, and Congressional Republicans are spineless wimps and RINOs. Nancy Pelosi earned a fortune buying IPO stocks using “illegal” insider trading techniques that would result in years of jail time for the average person, a newly resurfaced investigation found. 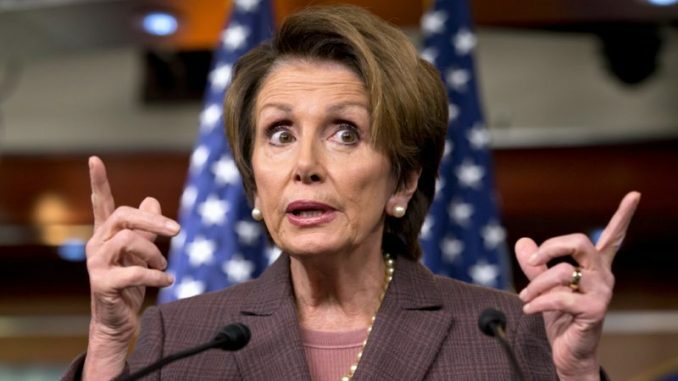 Pelosi reportedly used the information she had exclusive access to as Speaker of the House to make trades on stocks, allegedly netting the senior Democrat up to $100,000 in 48 hours on a single trade. As the battle continues between President Donald Trump and Pelosi’s Democrats over funding for additional border security, the House speaker’s own home often gets brought into the argument. In January Pelosi declared walls to be “an immorality,” yet many have asked if walls are “immoral,” then why is the Pelosis’ mansion surrounded by a wall? When these questions are asked, it draws attention to lavish property Nancy and Paul Pelosi call home, yet questions as to how the couple has amounted the vast wealth required to live such a lifestyle are never adequately answered. According to the House Press Gallery, House speakers earn an annual salary of $223,500, which amounts to a roughly $30,000 raise for Pelosi, who is now again the third-highest-paid elected official in the U.S. federal government (after the president and vice president). Of course, this is a substantial salary by any means, but it doesn’t come anywhere near to accounting for Nancy Pelosi’s huge net worth. According to Time, estimates of Pelosi’s net worth vary. Roll Call’s most recent Wealth of Congress analysis says she’s worth at least $16 million, but OpenSecrets puts her around $100 million. She has refused to talk about it. What we do know comes from her financial disclosure reports. For example, she and her husband, Paul, own a house and vineyard in California that’s worth at least $5 million and that brought in between $15,000 and $50,000 in grape sales in 2017. She owns a commercial property and a four-story building in San Francisco that each earned her at least $100,000. She also has stock in Apple, Facebook, and Disney. Paul Pelosi makes most of his cash from Financial Leasing Services, Inc., an investment company. But he’s not always bringing home the metaphorical bacon: He recently lost millions of dollars as the owner of the Sacramento Mountain Lions, a soccer team in the short-lived United Football League, according to Roll Call.